Do you have a way to collect memories? I have always been a collector. As a child I had an awesome sticker collection! I carried my little unicorn sticker book around everywhere. The puffy and scratch and sniff stickers were my favorite. picture frames, owls and lots of other stuff. But one of my favorite things to collect is memories. How does one collect memories? In a rusty, old jar of course. hotel key cards, and concert tickets. pieces of paper is a memory. I would save if my house were on fire. After my family and my external hard drive that is! We're doing a memory jar this weekend at Katie's pancake breakfast! I have been hoarding ticket stubs, restaurant/shop cards, and small momentos in a pile in my closet. They never seem to make it into albums, but I'm too sentimental to throw them out. 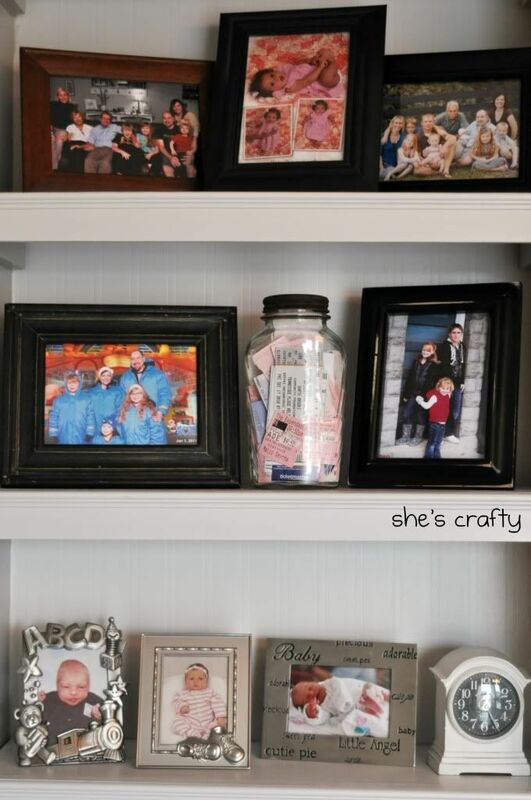 I love how this idea contains the treasures and let's you display them in such a pretty way. I will have to start one soon. I love this idea! I am a saver as well... just found a ticket stub from 10 years ago yesterday :) I need a system and this might be the one! You know what...this is a great idea. I love it! I have a lots of stuff, tikets etc everywhere and I'm tempted to throw all away..But this could help to organize and save some memories! Oh I love this idea, I usually throw things out to avoid clutter, but this is a great alternative! Thanks for posting this. I just have a shoe box full of stuff, but I love that you can see the memories in the jars. This is so cute! My best friend and her boyfriend attend every concert they can, this would be so cute for them! I would love if you shared this over at Totally Inspired Tuesdays at The Inspired Collection! Its going on now! 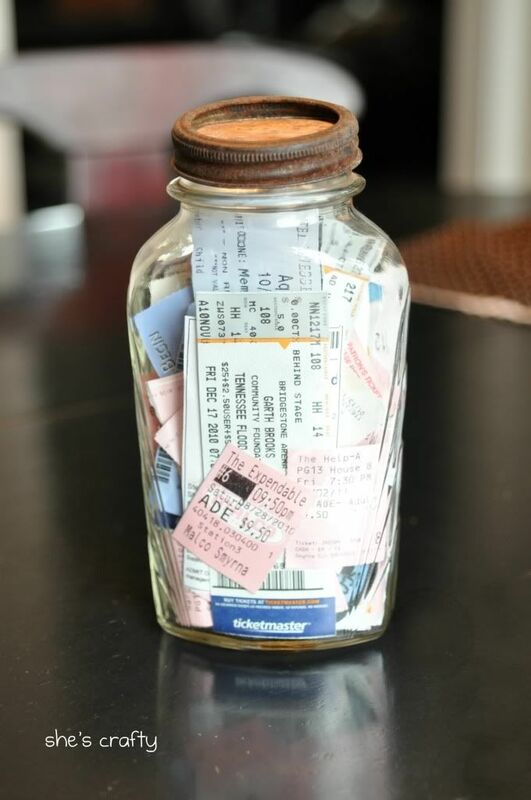 Great idea- I never know what to do with all the tickets. 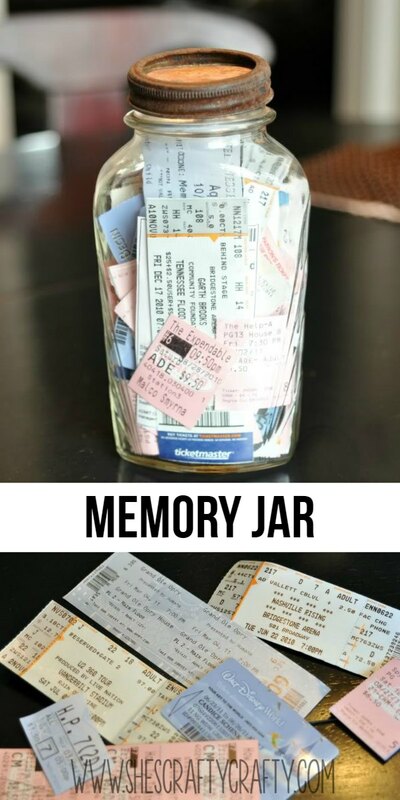 Usually I put them in journals but I love the jar idea. We also have a sand collection at our home, where we collect sand from wherever we go & put them in jars. I could kick myself! 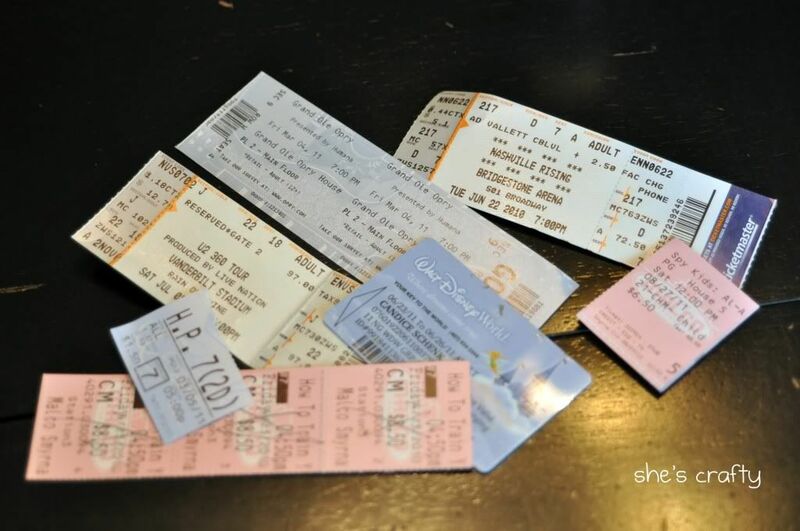 I threw out most of my ticket stubs, miscellaneous key cards, park stubs.. about three or four months ago. This would have been perfect. I am a scrapbook-er and never got around to putting them in a album and thought I would never do it so I tossed them because I have this thing about being organized. Seen this on Pinterest today,what a great idea! I am going to start a jar today! One question, what kind of jar are you using.. size? This is so cool! And I still have my sticker collection. I'd love to do this one day ... would you mind if I pinned (on Pinterest with a link back to this post) it for later reference? Love this idea! It looks great as decor in my family room too. Thanks for the idea! I am giving you a shout out on my blog tomorrow. What a great idea, think I will try and "sell" the idea to my son, who is talking about putting all his movie tickets in a book.... And let me tell you, that book is going to be huge...lol - this seems better. Thanks for sharing. I love this idea! I am a saver as well.